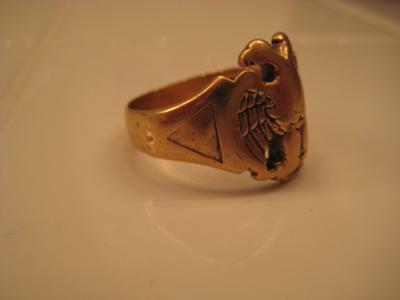 I inherited this antique Scottish Rite ring from my grandfather who passed away in 1982. I know he reached the 32nd degree, but don't know anything else. He lived in Buffalo, New York and was a member there. I'm assuming this ring dates back to the 30's, 40's or 50's. Is it worth more than it's weight in gold? 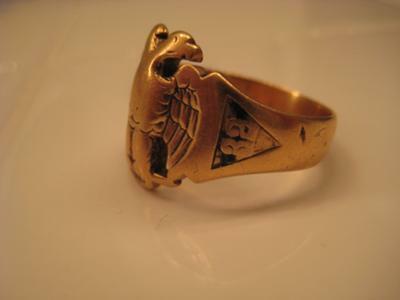 Since I am not a jeweler, I cannot appraise this ring, however, antique Scottish Rite rings, as well as many antique Masonic rings can be quite valuable to jewelry collectors and Masonic memorabilia collectors. If you wish to sell this piece, even though gold prices are quite high, I believe it is more valuable as a collectible than if sold as scrap gold. If you placed it on E-Bay or via another medium, such as Craigslist, I believe you might be surprised at its value, especially, since it is 60-80 years old. Hope this is helpful, John. I say this not only to the author of this post, but to all who inherit any Masonic items of passed away family. Most important is some of these items are to be buried with the lost Masonic member, so you should always contact a recognised lodge regarding burial traditions if not a brother yourself. Consider it family treasure and make sure, if possible to pass down and explain to the next holder in the family never to sell it and explain what you can so he knew of the great man who owned it. If storage or interest in the inherited Masonic items, such as an inherited Scottish Rite Ring, is unavailable, I ask you to please find a local recognised lodge and donate it for historical purposes and rightful ownership to keep cowans at bay. My Grandfather, who passed away years ago, was a Mason and 33rd degree Scottish Rite Mason. As I became older and my husband got involved, it piqued my curiosity. I Googled the Masonic Lodges and also Scottish Rite Temples in the area he lived in and they were very gracious, pointed me in the right directions and helped me obtain much of his "history". Before I knew i,t one of the "secretaries" sent me an e mail with an attachment, and right there in front of my eyes was my Grandfathers signature and dates on a few documents they were able to share. Thank you, Simon, regarding your comments on my grandfather's 32nd degree ring. Do you know of any antigue Masonic jewelry appraisers in the Los Angeles area? No, I'm sorry, I don't. Many jewelers are knowledgeable about Masonic jewelry, however. You might give one of them a call, beforehand, and ask if they are familiar with appraising Masonic jewelry or, if not, perhaps they can recommend someone else who is.